Coppola’s 1972 classic The Godfather has long been a source of inspiration for audiences and filmmakers alike. The themes of family, power and corruption, alongside seminal performances from cinematic icons, make it one of the premiere examples of the gangster genre and a masterpiece in its own right. Director Park Hoon-jeong (박훈정) is clearly a huge admirer – he claims to have watched The Godfather over a hundred times – for he explores such topics, in conjunction with his own unique vision developed as screenwriter of The Unjust and I Saw The Devil, within exemplary gangster film New World (신세계). Exploring the dynamics of power within a criminal cartel turned conglomerate (or chaebol, as they are known in Korea), the story weaves a twisted and highly engaging web of suspense-filled intrigue. Ironically however, the focus on such power struggles makes the narrative a somewhat impersonal affair. Yet the film features excellent performances by an A-list cast alongside some truly gorgeous cinematography, combining to make New World a powerful and captivating addition to the genre. When the head of the Goldmoon corporation is killed in highly suspicious circumstances, a power vacuum is left in his wake. Yet the company is not a typical chaebol. It is an amalgamation of several different criminal organisations, brought together to expand their illegal operations under the guise of an enterprise. Among the candidates to become the next ‘kingpin’ of the cartel are stoic Lee Ja-seong (Lee Jeong-jae (이정재) and close friend Jeong Cheong (Hwang Jeong-min (황정민), as well as the aggressive Lee Joong-goo (Park Seong-woong (박성웅). Yet unknown to everyone within the organisation is Ja-seong’s dual role as a police officer, repeatedly putting his life on the line to report to Section Chief Kang (Choi Min-sik (최민식). As people on both sides of the law wage war for power, choices must be made and bloody confrontations forced in order to sit at the head of Goldmoon. As with prior film The Unjust, director Park once again proves himself a master of balancing multiple characters. Each member of Goldmoon and the police force has an agenda, and director Park does incredibly well in portraying how each of them attempts to achieve their goals. The character development is consistently believable and occurs as a result of the desire for power, making the story an enthralling experience. This is also in no small way due to the performances of the A-list cast. Choi Min-shik in particular is outstanding as Chief Kang, a veteran cop who realises the monster he has become yet cannot quit. The actor conveys a brilliant complexity within the role, authoritative and intelligent yet self-loathing and frustrated. As Chinese descendant Jeong Cheong, Hwang Jeong-min is also superb. Amazingly he turns an extremely deplorable gangster into a likable jerk, with his foul-mouth and extravagance with fake goods masking a dangerously violent criminal. Ironically Lee Jeong-jae is somewhat short-changed as lead character Ja-seong. His role is the most complex as Ja-seong must play both sides of the law and stay alive, yet there are only a handful of moments where the character develops and genuinely feels threatened. Nevertheless, Lee Jeong-jae is very competent in the role. Furthermore, rarely has a gangster film been so attractive. Director Park immediately places the audience within the violent, dark underbelly inhabited by the protagonists utilising great vision and skill. The composition, lighting and cinematography combine to produce some truly gorgeous aesthetics, conveying the Goldmoon hierarchy, the brutal violence, and stunning landscapes with minimal dialogue. The beauty of the dockyards at dawn is wonderfully contrasted with characters forced to swallow cement, and wonderfully captures the bizarre duality inherent in Ja-seong’s life. Such powerful and compelling imagery continue throughout the entire film, from the cold metallic offices in Goldmoon to the shadowy secret liaisons and deals that take place. New World is a genuine visual triumph, and the passion and attention to detail within every shot is palpable. While director Park does a great job balancing and positioning the protagonists within the film to culminate in a powerful conclusion, the film also suffers from being overly ambitious. As enthralling as the story is, there are simply far too many characters within the narrative and too little time to fully construct them. Song Ji-hyo exemplifies this issue, as the talented actress is given precious few scenes in which to establish her role as a crucial player. However it is again Lee Jeong-jae who suffers the most in this regard, as his personal life – including an interesting sub-plot regarding his pregnant wife – is glossed over in favour of focusing on his status as a mole. The narrative is so concerned with the Goldmoon power play that, crucially, there is little reason provided to care about Ja-seong’s predicament on an emotional level. Despite such criticism, New World is an incredibly powerful and exemplary gangster film. 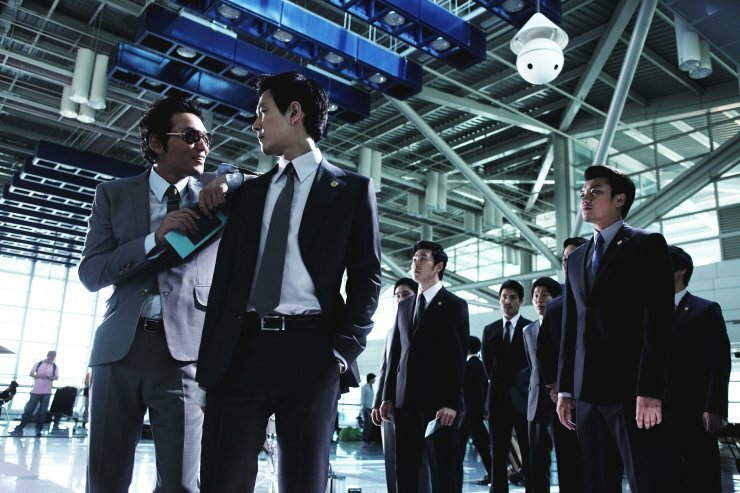 The exploration of power and corruption within the Goldmoon chaebol as well as the police force is continually fascinating, even more so when taking into account such issues are a genuine social concern within contemporary Korea. Director Park has crafted an enthralling gangster epic, and fans of the genre will undoubtedly love it. 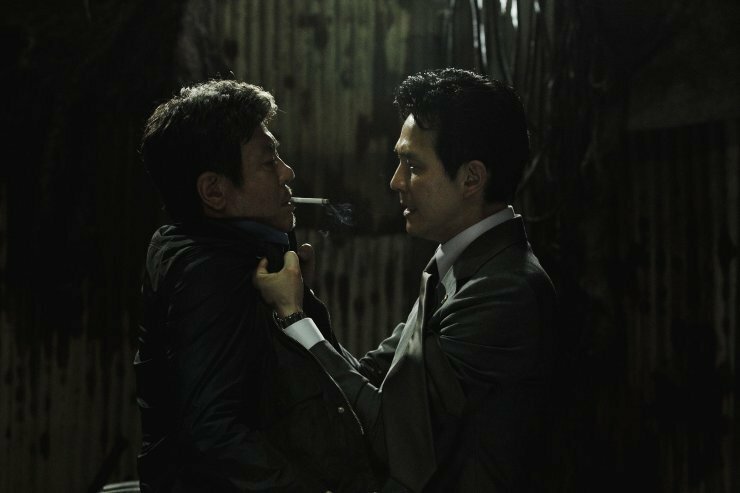 New World (신세계) is a powerful and exemplary gangster film, examining the power play that occurs when the head of a criminal corporation is killed. 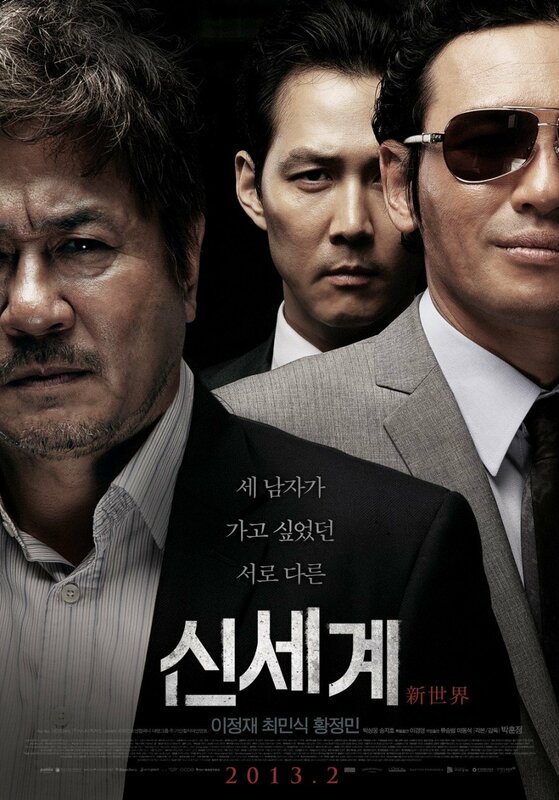 Director Park Hoon-jeong (박훈정) expertly weaves a tangled web of gangsters and police into a compelling and thrilling story of corruption and betrayal. The film is also bolstered by fantastic performances from A-list stars including Choi Min-shik, Hwang Jeong-min and Lee Jeong-jae, who are continually fascinating to watch. While the focus on positioning characters and the shady deals that are made make the film a somewhat impersonal affair, New World is enthralling gangster epic that fans of the genre will not want to miss. I completely agree with this review. The film was beautiful but some parts felt missing. I kept saying that for a main character Ja-Seong sad very little. We didn’t get to know what he was thinking throughout the film. Some of the more promising characters seemed to be forgotten (his wife and handler for instance). The ending was satisfying in a strange way, I knew it was the best decision for the character but I didn’t really care and I wanted to.